Synthetic phospho peptide: SFRSFSpFEKPRQ, corresponding to amino acids 422-433 of Human SH3BP2. Phosphorylation of SH3BP2 occurs on Ser 427 for activation. SH3BP2 mediates interactions of huntingtin and MLK2 (mixed lineage kinase). Affinity purified chromatography using phospho peptide coupled to agarose beads followed by solid phase adsorption(s) against non-phospho peptide and non-specific peptide to remove any unwanted reactivities. Reacts in Western blotting with a band at about 60kD, that probably corresponds to SH3BP1 (Not tested for phospho specificity by Western). Tested in peptide ELISA against 0.1 ug of the immunizing peptide. Binds differentially to the SH3 domains of certain proteins of signal transduction pathways. Binds to phosphatidylinositols; linking the hemopoietic tyrosine kinase fes to the cytoplasmic membrane in a phosphorylation dependent mechanism. Expressed in a variety of tissues including lung, liver, skeletal muscle, kidney and pancreas. Defects in SH3BP2 are the cause of cherubism (CRBM) [MIM:118400]. CRBM is an autosomal dominant inherited syndrome characterized by excessive bone degradation of the upper and lower jaws, which often begins around three years of age. It is followed by development of fibrous tissue masses, which causes a characteristic facial swelling. 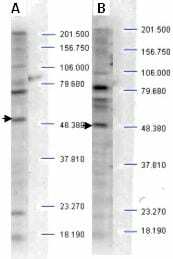 Western blot analysis is shown using ab2176 to detect endogenous protein present in unstimulated human whole cell lysates. The band as indicated by the arrowheads is evident in both M059 cells (panel A) and PC-3 cells (panel B). Comparison to a molecular weight marker indicates a band of ~60 kDa that probably corresponds to human SH3BP2 protein. The blot was incubated with a 1:500 dilution of the antibody at room temperature followed by detection using standard techniques. ab2176 has not yet been referenced specifically in any publications. Publishing research using ab2176? Please let us know so that we can cite the reference in this datasheet. There are currently no Customer reviews or Questions for ab2176.